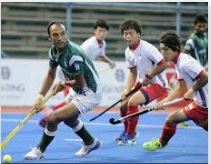 STORY: Pakistan’s hockey team manager Hassan Sardar said that repeatedly missing chances cost them a win against Malaysia and ended up splitting points in a 1-1 draw in the ongoing World Cup in India’s eastern Bhubaneswar city on Wednesday (December 05). Sardar said that four-time champions had failed to capitalize on their chances in the previous match against Germany. The draw means that both the teams have a chance to go through to the quarterfinals and need to win their last game. In the other pool game, Germany came from behind to beat Netherlands 4-1. Malaysia will face Germany while Pakistan take on Netherlands in their final pool game on Sunday (December 09). Meanwhile, Academy Award winning composer A R Rahman launched the official song of the Men’s Hockey World Cup in India’s Mumbai. The song is titled ‘Jai Hind’ (Victory to India) and also features Bollywood superstar Shah Rukh Khan.